I found “Assorted Japanese Junk Food for Sake” at the Amazon website through a 3rd party vendor. The advertisement said, “Japanese junk food to go with Alcohol”–a somewhat literal translation of the more polite expression “drinking snacks”. Somehow, for Japanese, “Junk food” or drinking snacks may not have the same negative connotation it has for the U.S. audience. In general Japanese don’t drink without eating something, so at the very least, such a snack is a “must have” to go with sake. In any case, this product on Amazon is “known as “Kawaki-mono” 乾き物 or “dry drinking snacks”. This type of snack or “otsumami” おつまみ is widely sold in Japanese convenience stores and stand-up drinking joints called “Tachinomi-ya” 立ち飲み屋 or “Kaku-uchi” 角打ち. Digression alert: On our last trip to Japan, in the evening, when we had a several hour train ride from our site seeing destination back to our hotel, we really liked stopping at the convenience store usually located next to the station before boarding the train to purchase some sake and snacks to eat on the ride. It was a mobile cocktail hour (imbibing sake on the train is completely legal, acceptable and civilized. If you don’t have time to stop at the convenience store before boarding you can even buy some from a cart on the train). It was a great way to relax after a hard day sight seeing–munching on flavored dry squid or cheese snack thingies sipping sake watching the sun go down. Come to think of it, our experience in Japan may have led us to try the snack sold on Amazon. This package consisted of 10 different kinds of snacks. The individual packages are rather small and we could finish one or two packages easily in one sitting. It is rather expensive since one package is about $3 but they are rather authentic Japanese snacks. 1. Grilled dried squid strips (it is labeled as “hand-grilled” with “direct (charcoal) flame”. 2. Grilled dried fins of ray (“soft finish”). 3. Spicy dried and grilled squid legs. 4.”Kimuchi” flavored dried “himo*” or gills of scallops. 5. “Spicy cod roe” flavored grilled squid legs. 6. “Otsumami” dried small flying fish (lots of calcium!). 7. “Butter and soy sauce” flavored dried squid strips. 8. Dried and grilled sea eel. 9. Sea urchin flavored grilled and dried squid strips. 10. Dried squid strips in squid ink. * membranous tissue on the periphery of the scallop muscle . Many of these items tout that they used all domestic (Japanese) ingredients. 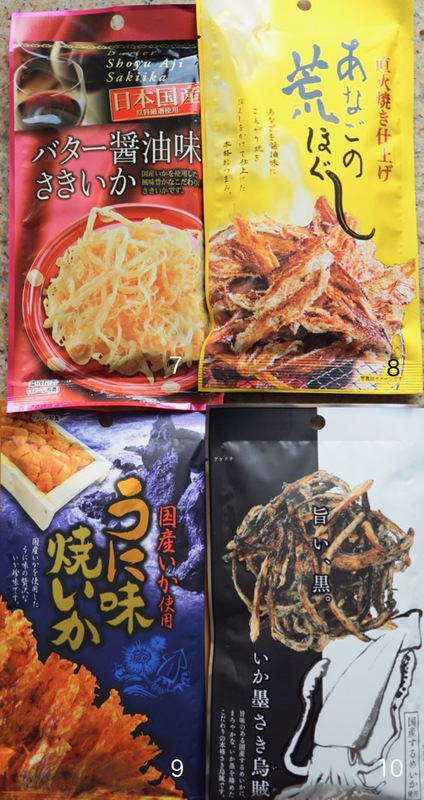 As you may or may not have noticed “dried squid strips” with different flavors are the most popular snacks in this round up. We tasted several of these snacks. In our opinion, they go best with bourbon and water and certainly sake but definately not with wine. In general the items we tasted so far, were pretty good, the only one we did not like was #4. It was extremely chewy even for me. My wife characterized it as chewing a rubber band and just could not handle it. In addition, its “kimchi” or “kimchi” flavor is not one we liked. The picture below shows the amount you get in one bag. So this is a bit on expensive side ($3 per pack). But on the “up-side” they are exactly like the ones available in Japan which are generally not available here. #1 is “Butter and soy sauce” flavored dried squid strips. #2 is dried and grilled sea eel. #3 Spicy dried and grilled squid legs. #4 “Kimuchi” flavored dried “himo*” or gills of scallops. They are good and available on Amazon. With the small packages, my wife and I can have two different kind in one sitting. We are not sure if I will reorder, however.